April Egan Hairdressing is a hair salon based in the heart of Low Fell, Gateshead. We were thrilled when April approached us when looking to rebrand her salon to give it a more stylish and sophisticated look. As part of the rebrand we were tasked with designing and developing an all new website. The new website needed to give April and her salon team the ability to share inspirational ideas and current trends within a blog, as well as making it easy for visitors to access information about the salon, including opening times and prices. 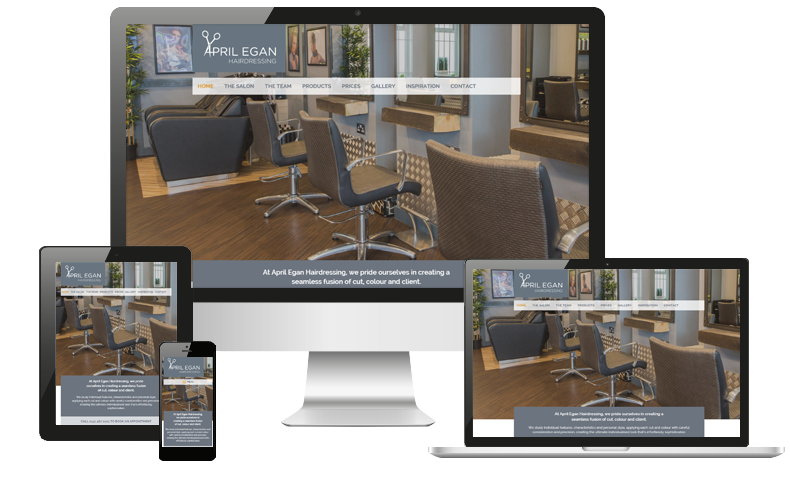 Using bold images of the salon, we created a responsive website that would show off the amazing style that the salon has to offer. By building the website in WordPress we were able to create the inspiration blog that would allow for multi-user access so that April was able to control who had access to the blog and also approve blog posts before they were added onto the site. As the salon is highly active on social media we also made sure that the site had the ability to automatically post notifications of new articles directly to their social networks in an effort to drive people onto the website.